Location, Location, Location! Southwest Exposure! Located on Prestigious Acton Island with a drive on bridge so available for all year rentals. Stunning 6 bedroom Muskoka cottage. Located only 5 minutes from Bala and 10 minutes from Port Carling, This beautiful cottage has all the amenities for a relaxing and memorable escape. Settle for nothing less - south west exposure and breathtaking views of beautiful Lake Muskoka. With a sand bottom and a walk in shoreline, makes it easy for children and grandparents. Granite rock base encompasses the large fire pit with seating for 16! Exterior includes large propane BBQ, dinner seating outside for 12,dinner seating inside for 12 plus 4 seats at the kitchen island.4 loungers, 15 RED muskoka chairs, 2 white muskoka chairs, 12 rustic wood chairs, 2 large benches +++. Also added is a brand new slide off the dock! Lower level for those rainy days includes 2nd family room and games area. Games area includes: Pool Table, Ping Pong, Poker Table, Fuzz Ball Hockey and Basketball hoops game! The cottage has 4 televisions with DVD player (55 inch, 50 inch and 45 inch & 40 inch). Also a selection of DVD's! This Property has it all- Only 7 minutes to town- located on a Island you drive too! Has easy walk in beach area for young guests and 5 feet off end of dock! Great area close to everything. Highly sought after Exclusive Address in Muskoka. Great Lake and close to restaurants, golf and shopping. Steps to water- You can see the Lake out of Kitchen, Both Family Room, Games area and 3 of the 6 Bedrooms have Lake view! Gorgeous walk-in to lake with sand beach for the kids to play in! Full size Fridge, Full Size Freezer, All S/S Appliances, Built in Dishwasher, Microwave, 2 sinks, Granite counter and backsplash. Island with 4 seats. Seating for 10 plus at table. We have many videos just in case it Rains. Lots of board games too! BRAND NEW 2011! Location, Location, Location! Southwest Exposure! 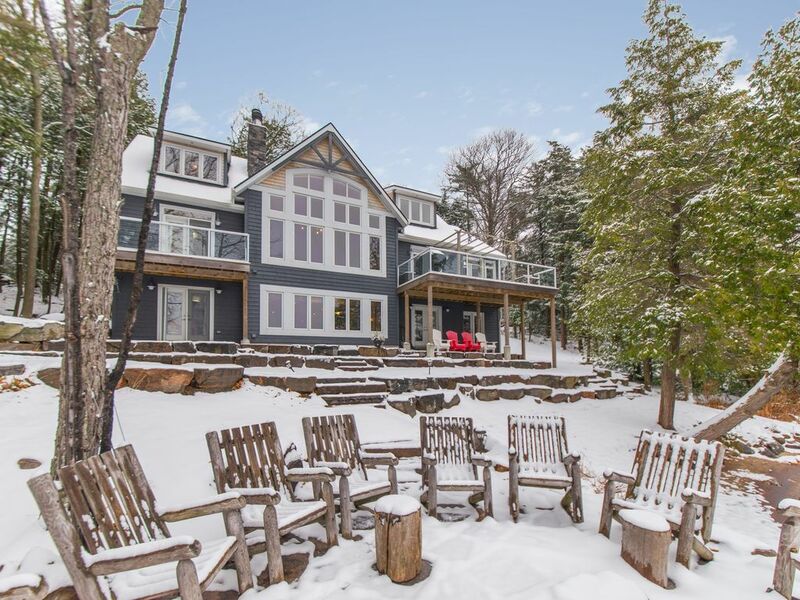 Stunning 6 bedroom Muskoka cottage. Located only 5 minutes from Bala and 10 minutes from Port Carling, on prestigious Acton Island which has a permanent year round connecting bridge. This beautiful cottage has all the amenities for a relaxing and memorable escape. Settle for nothing less - south west exposure and breathtaking views of beautiful Lake Muskoka. With a sand bottom and a walk in shoreline, makes it easy for children and grandparents. Granite rock base encompasses the large fire pit with seating for 12! Exterior includes large propane BBQ, dinner seating outside for 12,dinner seating inside for 10 plus 4 seats at the kitchen island. 2 loungers, 6 muskoka chairs, 7 rustic wood chairs, 2 large benches +++. Also added is a brand new slide off the dock! Breathtaking sunsets, privacy, parking for 5 cars, oversized windows with 18 foot ceilings and 2 breathtaking stone wood fireplaces. Finished basement/games room. Beautiful and fully equipped cottage!! Everything you want and need for an amazing weekend! Decor was stunning! Best games room ever! Relaxing and luxurious! A beautiful property - perfect for our weekend getaway! We stayed at the Beach House in Fall 2016. We spent a weekend there, and left wishing we had a third night to spend. Absolutely no complaints about the property. The condition of the building and surrounding area is immaculate, and the amenities don't seem to end. The kitchen is fully equipped, there was enough square footage for 13 people comfortably, and the outdoor seating area is picturesque. We wanted for nothing the whole weekend. Thank you to Cindy who was prompt and diligent in her communications. Highly recommend. This review is a long time coming but no less heartfelt all the same. We stayed at Cindy's cottage last Fall. We were two families with eight children in all, ranging from 17 years to five years old. The cottage was just perfect in every way. There was absolutely nothing that could have been done to make our stay more relaxing. There was ample space for everyone. The children played outside, and in the games paradise that is the basement, and then there was lots of comfortable sofa space for us all to gather by the fireside for board games in the evenings. Waking up every morning, looking out at the lake, I thought I had died and gone to heaven. The beds were so comfortable and the decor just a pleasure to look at. Thank you, Cindy, for providing such a delightful, restful experience and for being so easy to deal with. We shall most certainly be back. My friends and I have been to this cottage three times now, and will definitely return. It's a beautiful place, has amazing amenities and is in a great location. Great in the summer and winter, with or without kids. A perfect find! Fantastic luxury cottage with every amenity! Our family (which includes three kids and two grandparents) had a lovely Thanksgiving vacation. Our kids even swam (for all of 30 seconds) in gorgeous Lake Muskoka! This cottage is the utmost in luxurious accommodations. The most comfortable mattresses on earth, every kitchen appliance or utensil you could need, lots of fun games for the kids and young at heart. Many great things to do nearby. Hiking, shopping and dining. Highly recommended! We have games area with table for Poker, Pool table, Ping Pong table, Hockey table, Darts and Basketball hoops game. Long weekends and holidays weekends are $790 a night and 3 night minimum. Off season is 2 night minimum. Christmas and New Years are weekly rental $5200.